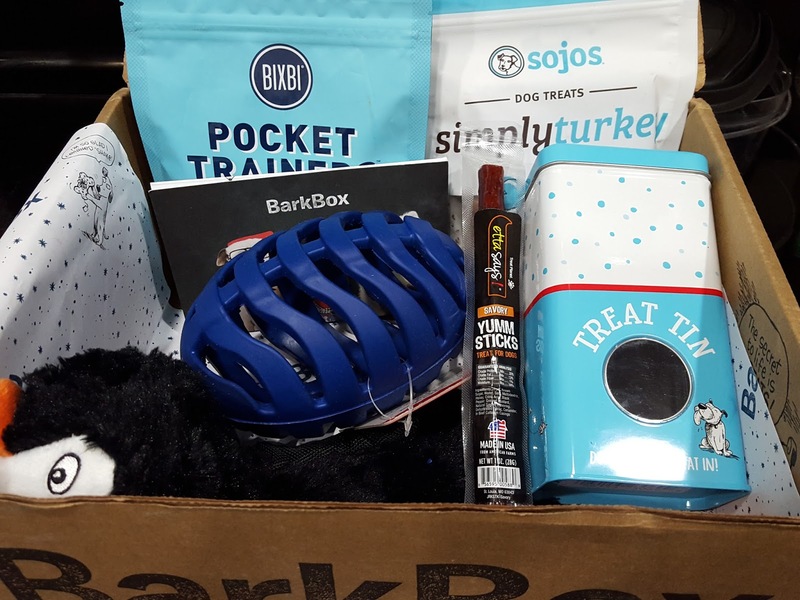 Pint-sized and Simple: BarkBox Review - December 2015 + Get A Free Box! I would be lying if I said that BarkBox day is like any other day. Because it isn't. It's like having Christmas every month. In fact, I think I get more excited about my dogs' sub boxes than my own. It's fun to see what new toys and treats will preoccupy my troublemakers during the upcoming weeks. Barkmade Pixel the Penguin (Value: $16) - I'm going to start with my favorite thing in here. 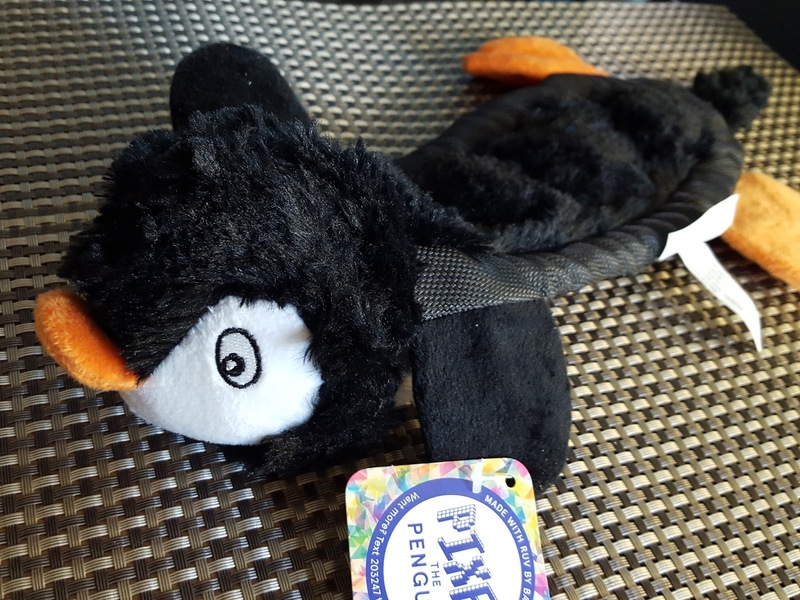 This cute penguin is squeaky and crinkly, two of my dogs' requirements for a worthy toy. And so far we're two for two in the durable toy department - two months ago I asked if we could get heavy chewer toys and since then our Barkbox toys have been tougher than the usual plushies they send out. Pixel has a plush outer layer, but just in case your dogs are a bit chew-happy like mine are and shred that layer to pieces (*sniff*...such a cute penguin, too), there's a rope and tennis ball hiding inside for them to play with. Dogzilla Penguin Egg (Value: $17) - Okay, am I the only one who thought this was a football? In my defense, the only time I've seen a penguin egg was on March of the Penguins. I'm always glad to receive rubber toys because they take Pebbles a little longer to destroy. This egg is made of flexible rubber so stuffing it with any sized treat should be a piece of cake. That also means they're easier for the pups to remove, so be prepared to stuff a lot of them in there! I'll save this for when if Pebbles makes Santa's nice list. Barkmade Treat Tin (Value: $5?) - This is a thoughtful inclusion to the box. 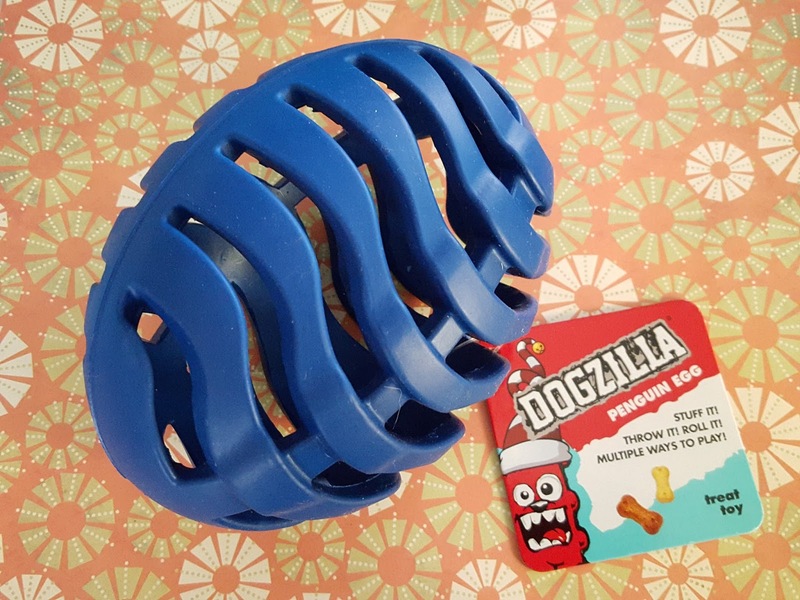 It's a great size for Xmas treat gifting to your dog's favorite playmate. 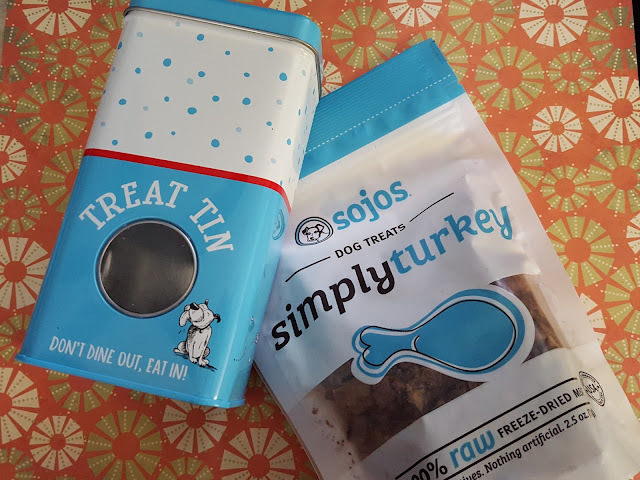 Since it's a plain tin it isn't airtight so I wouldn't recommend storing meaty treats in here, but go ahead and stuff it with all the biscuits your pup-friend's belly desires. Sojos Simply Turkey (Value: $11) - Freeze-dried meat will always be on my furballs' Top 5 list of all-time favorites. It's what Macho was trained with. He valued freeze-dried-anything higher than his squeaky toys (until he discovered bully sticks, but that's another story). Now Pebbles does anything for a piece of that lyophilized goodness. What's great about freeze-dried food is that you can rehydrate it by adding a bit of water and your dog will think he's getting a can of Cesar's gourmet dog food! Christmas turkey dinner for all! Bixbi Pocket Trainers - Chicken (Value: $8) - I'm always going to love getting training treats in boxes because it's one of those things that you can never have enough of. I use them all the time even though the dogs are already trained (though I sometimes wonder about one of them...*ahem* Macho). It's good to reinforce their training with a treat every now and then so they continue to follow your commands. 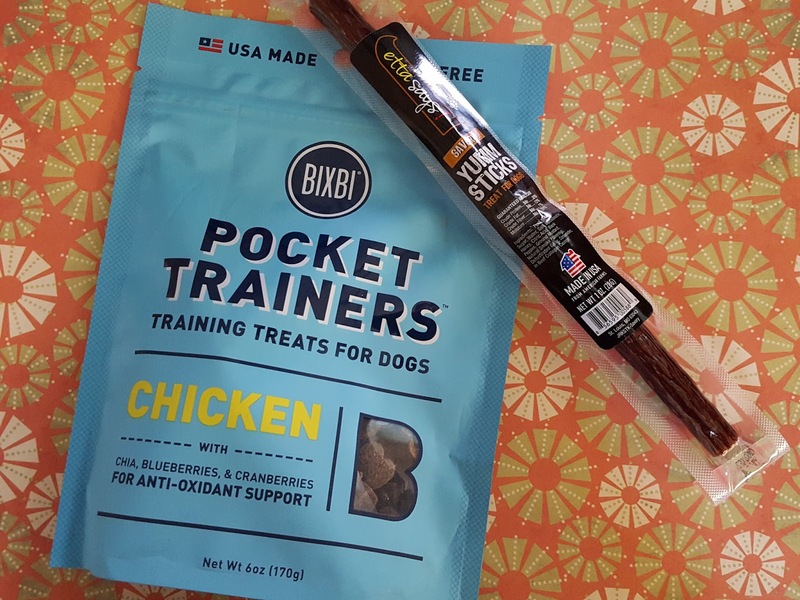 And since these training treats are tiny (only 4 calories apiece) you don't have to feel as guilty for giving a jackpot of several treats if your dog does something totally awesome like pee in the toilet bowl...and flush. Etta Says Savory Yumm Sticks (Value: $3?) - This month's chew looks exactly like a beef stick, the kind that people eat. It's so convincing that if I left it on my counter I am 90% sure C would eat it thinking it's for him. In fact, based on the ingredients list I think a human could actually consume this and get away with it. There's nothing too foreign-sounding in here. Of course, since food-processing sanitation regs differ for animals and humans, you miiight want to think twice about trying it for real. Have a dog in need of spoiling? Sadly, it might be too late to give your dog a Barkboxin' Christmas, but it's never too late to show your pup how much you love him. :) Give Fido his own stash of all things dog by becoming a Barkboxer here! You'll get lots of unique toys and treats for your BFF that you can't find anywhere else - over half of the toys you get are Barkbox exclusives. Use referral code DOGSYAY to get a box for as low as $18/month -- plus get a free box tacked on to your subscription just for using my code! There's no expiration date and this offer is open to all new subscribers.